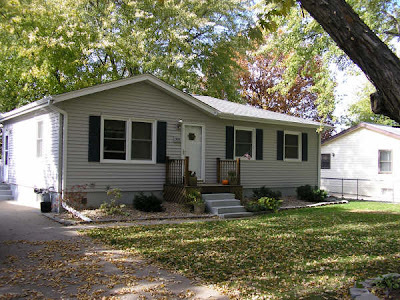 Angela May's Omaha Nebraska Real Estate Blog: NEW LISTING!!! 4Bed/2Bath - Great Home with Many Updates! NEW LISTING!!! 4Bed/2Bath - Great Home with Many Updates! This home won't be around for long! Beautiful 4 bedroom home nestled in District 66 close to Paddock Elementary. This jewel is move-in ready with many updates & extras to include; New Roof 02, New Windows on Main Floor '06, New Furnace 06, New Vinyl Siding '02, Newer Carpet in Family Room on Lower Level. Large eat-in kitchen with half-wall to living room, refinished kitchen cabinets & updated countertops & hardware + all appliances stay (including washer & dryer). Open floor plan with gorgeous honey-colored hardwood flooring throughout. Other surprises include; newer glass block window in main bath, laundry chute in linen closet, amazing built-in dresser in 2nd bedroom. Huge finished walk-out lower level including great built-in cabinetry, corner hutch, abundant storage, 4th conforming bedroom & 3/4 bath off finished laundry area. Oversized garage with storage, great deck (with newly replaced floor boards) and fenced yard ready for you to occupy!